Bluewater Dewaxit surfboard cleaner and wax remover is the ultimate solution for keeping surfboards looking great and enhancing your surfing experience.The special formula in Bluewater Dewaxit will safely remove the unsightly presence of Surf Wax Tar Sticker adhesive Grime Sunscreen oils. 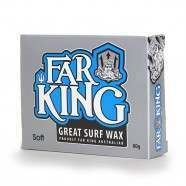 Surfers have always been passionate about protecting their environment âââ€š¬" Bluewater Dewax.it delivers a convenient and clean option that supports these environmental issues. Bluewater Dewaxit is so easy to use and takes the hard work out of surfboard prep whether for applying new wax decals or pads or just keeping your surfboard in pristine condition. :: Unisex > Surf Accessories. Environmentally friendlyRemoves wax with easeSafety cap250ml bottle Size: one size.